​yourself in a cellar, filled with vintage synthesizers and analog sequencers, flashing lights, knobs and faders everywhere, playing Berlin School electronic music. If you don't have any of that equipment to your disposal, this library is the next best thing. This library tries to bring some of that sound and feeling to your home and studio by supplying vintage arpeggio patches. ​electronic genre of music was first made in Berlin in the 1970's, hence the name, by electronic music artists like Tangerine Dream, Klaus Schulze and Ashra. Typically for this type of music are the evolving, atmospheric and hypnotic layered sequencer textures. The sound consists basically of ambient elements combined with short, repeating sequenced runs of notes, which gives the music a rhythmic element. ​is a Kontakt 5 library aimed at this genre of electronic music from the 1970's and 1980's and consists out of vintage arpeggios, and a few modern ones too. Inspired by musicians like Jean Michel Jarre, Tangerine Dream, Klaus Schulze and others. If you like this kind of music you won't be disappointed by this library. But of course nobody can keep you from using this library for other styles of electronic music. Because the library is all about arpeggios, mimicking the old analog sequencers, the arpeggios are in straight time signatures (1/2, 1/4, 1/8, 1/16, 1/32, 1/64 and 1/128) and triplet time signatures (1/2T, 1/4T, 1/8T and 1/16T). Most used in this library are the 1/8, 1/16, 1/32 and 1/8T and 1/16T time signatures. ​are divided into three folders, two folders ‘Building Blocks’ and ‘Arpeggios’ which in turn are divided into two folders, 'Straight' and 'Triplets' and one folder with ‘One Shot’ patches. The patches in the ‘Building Blocks’ folder are single arpeggios, one instrument, meant to contruct multi-layered arpeggios. The multi-layered arpeggios can be found in the ‘Arpeggios’ folder and they are the ones that will give you that ‘Berlin School Electronic Music’ sound and feeling. The patches in the ‘One Shot’ folder can be used to make your own rhythms in your DAW instead of using the Kontakt arpeggiator. Patches that use Aftertouch and the Modulation Wheel as modulator for the Filter are marked with AT and MW. ​are on one page and ready for you to tweak. A patch exists out of two oscillators, which in their turn exist out of an Amplifier and a Filter section. The parameters can only be edited when the Oscillator is switched on.OSA uses four different effects to further sculpture the sound. The effects are: Reverb, Delay, Chorus and Phaser. The effects' 'Time' and 'speed' parameters sync to the Host tempo. Finally there is the Arpeggiator section of course to create and edit the Arpeggios. Only available when the Arpeggiator is switched on. This library will only work in the full version of Kontakt 5.1 or higher. When using the free Kontakt Player, this library will only work for 15 minutes in demo mode ! BABU JOHNMARIADOSS; "OSA CL-PROJECTS. Great product." Rodrigo Basso: "ARP OF 80'S. "Really nice Arp, very inspiring instrument Great for EDM and Pop Songs I really love CL-Projects Intruments." ​Jawad Abu-Lughod: "AWESOME SOUND DESIGNER. CL-Projects produces great sounding libraries at a reasonable price. I own all of his stuff, but the OSA is my favorite for retro grooves. I highly recommend you check them out. Easy patches to work with and great sound out of the box." ​Terenzio Alejandro: "POWERFULL. Great sound." BEL - INCANDELA JLB - FAB: "OSA ARPÈGES VINTAGE ET MODERNES. Rien à redire, le titre explique tout Il sonne vintage et moderne en même temps facile d'utilisation, simple et efficace. Il est typé avec un son analogue et des textures de séquençage en couches évolutives, atmosphériques voir hypnotiques. Pas fait pour les basses, mais tout le reste il sonne ! Bravo CL-Project et Merci Kontakt Hub." Ric Gregorio: "FUN! Tangerine dream ! This library is fun to tweak, well done!" 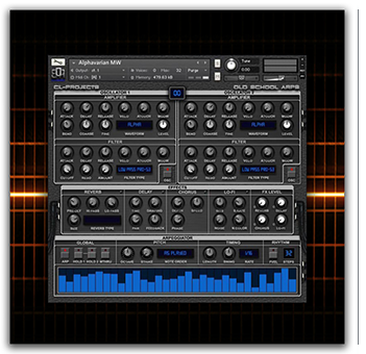 Steven Brenner: "A MUST HAVE VST. I was a little reluctant to buy this VST because the price was so good when I listen to the demo it impressed me so much that I just simply clicked buy it now and for sure to my expectations the plug-in is amazing you have to buy it!" Rafael Ruiz: "GREAT! Excellent, varied classic arpeggiator patterns! 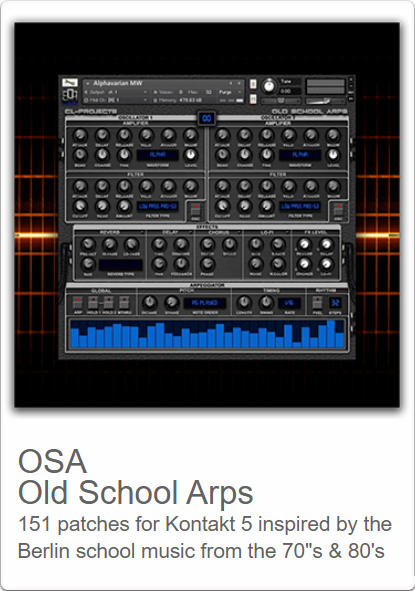 Better sounding than other arpegiators included with DAWS." Steve Montgomery: "INSPIRED BY TANGERINE DREAM!! Old School Arps that sound this great must be CL-Projects! Another hit from an incredible sound designer. I've had products like this that cost 3 times the price. Being a huge fan of Tangerine Dream, it's so awesome to find a Kontakt library that replicates the vintage Arps of these electronic masters." ANDREW VENABLE: "AWESOME SYNTH! Great job CL-Projects!" Kenneth K.: "Perfect. OSA is what I have been looking for in ages. I am a big fan of the sound of J.M.Jarre, Tangerine Dream and similar groups. The OSA has opened a gate for me, directly to this - Load it up, press a note on your keyboard and you are instantly in dreamland/synth heaven. Thank you so Much." Jouko S.: "OSA - precision weapon. Only what you need in seq-arpeggios :)." Boehm p.: "very good. Like the 70 -80 years."